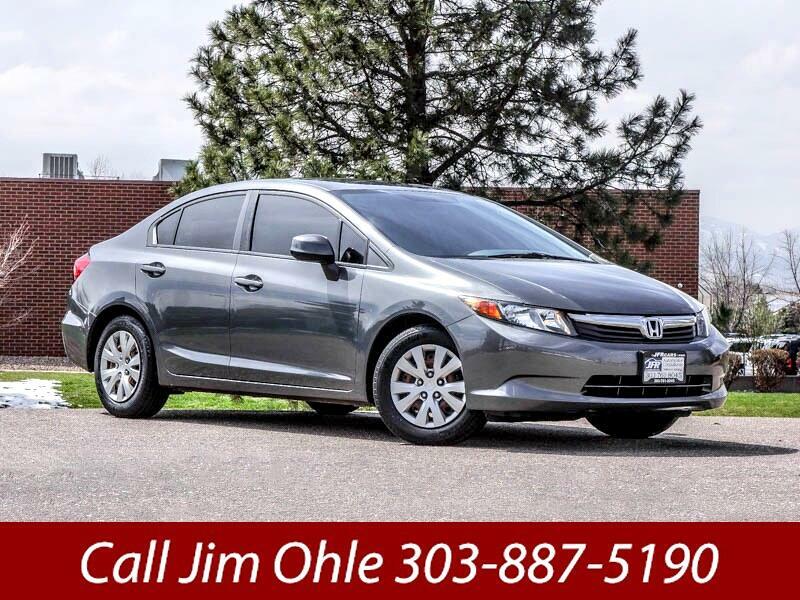 Used 2012 Honda Civic LX Sedan 5-Speed AT for Sale in Littleton CO 80120 JFR & Associates, Inc. This Civic presents a composed and comfortable ride quality with excellent fuel economy (City: 28 - Hwy: 39.) Fewer stops at the gas pump add up to having more money in your pocket every month. You'll appreciate the fact that this Honda Civic is still one of the better-driving cars in its class. The cabin is comfortable and offers plenty of space for you and your passengers. You'll find the controls are well-placed and easy to use and at your fingertips. This Civic comes with a variety of options like keyless entry, CD player, aux audio jack, steering wheel mounted controls, tilt wheel, the second-row folding seat, plus lots more to make your driving experience more enjoyable. You are cordially invited to take this Civic for a test drive and discover for yourself why this car is so popular. Contact us today and schedule a test drive. You'll be glad you did. Call Jim Ohle at 303-887-5190 if you have any questions or if you would like to schedule an appointment to see this vehicle.